Sun Basket is the leading healthy meal delivery service focused on fresh, sustainable, and organic ingredients with recipes catered towards customers on specific diets. 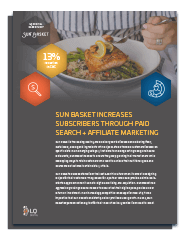 We are proud to partner with a brand like Sun Basket in an emerging subscription economy category to help them expand their business. Sun Basket’s data-centric culture when it comes to designing recipes aligns well with our data-oriented approach when we drive digital acquisition strategies for our clients. We are excited to continue this partnership to help Sun Basket dominate in their market!